“Sell Alameda Homes Now” – LET’S TALK! 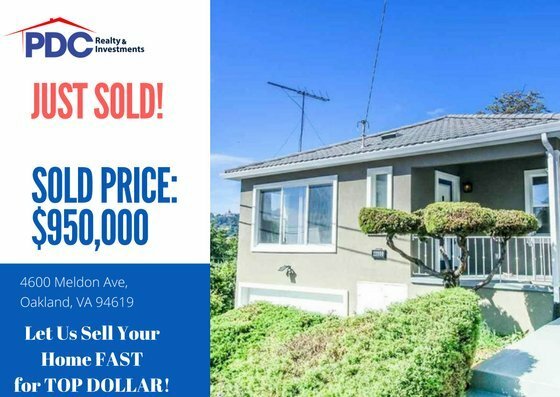 Our real estate team specializes in helping homeowners sell their home FAST for TOP DOLLAR – Sell Alameda Homes NOW! Contact us now to discuss on how to get the best deal for your home. We also have great knowledge and extensive network in the Bay Area to help you find your next DREAM home. Technically, there are no such things guaranteed in life. However, we do have one certain business practice: We deliver RESULTS, not promises. JUST SOLD!!! Sold for $950,000 on 06/06/2018. That is $150,000 Over Asking Price. Yes, it’s $150,000 Over and ONLY AFTER 27 DAYS. Refer to the listing history below for the property at 4600 Meldon Ave, Oakland, CA 94619. After taking over the listing on May 11th, 2018, our real estate team has put a significant amount of efforts, time and investment ($$) to market this home. With our unique strategic home-selling plan, we were able to score multiple offers after our first open house weekend. We eventually received the desirable offer and eventually accept the offer after 6 days from the listing day. Finally, we were able to close the deal for the RECORD PRICE in the neighborhood. $150,000 Over Asking Price. Our real estate team put our very best effort in marketing for this property and the outcome was above our expectations. Thanks to MY LINKEDIN NETWORK – MANY THANKS!!! I’ve received over 2,000 views and many likes for the new listing post of this property. Your strong support truly helps produce this very fantastic outcome! Do you still have questions, comments or concerns? LET’S TALK and we will figure out the best solution for your real estate needs.